What Are the Benefits of Living in Rock Hill and Fort Mill, South Carolina? 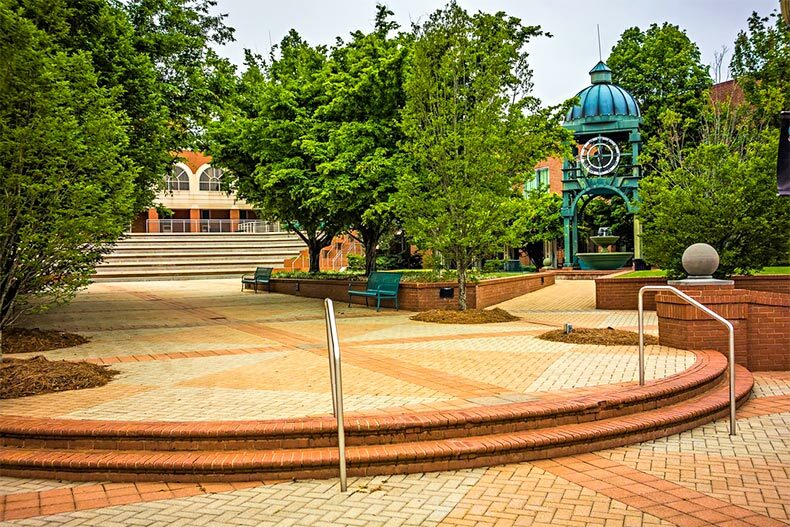 Rock Hill and Fort Mill both have their own downtowns with plenty of shopping and dining, all while being close to Charlotte and having a better tax situation. While the quickly expanding city of Charlotte, North Carolina is extremely appealing to new residents with its flashy skyline, endless entertainment, dining, and restaurant options, there are also many perks to living outside of the city in one of its surrounding suburbs. Located just across state lines in South Carolina — less than a 30-minute drive from Uptown Charlotte — are two of the fastest growing suburbs in the Carolinas, Rock Hill and Fort Mill, each of which have many draws for potential residents deciding between living in the big city or a smaller, quieter suburb. These benefits range from everything from less traffic and lower crime rates all the way to major financial benefits. Rock Hill and Fort Mill are much more cost effective than Charlotte with lower tax rates and housing costs, plus, South Carolina’s helpful tax exemptions for retirees. This large, age-restricted Fort Mill community is one of the most popular communities in the state of South Carolina. It’s made up of 3,160 single-family and attached homes that are spread throughout 1,512 acres of beautifully landscaped property. Built by Del Webb, the homes in Sun City Carolina Lakes are for resale only with prices starting from the low $200s. Sun City has many desirable indoor and outdoor amenities that include two clubhouses, an on-site restaurant, cafe and coffee shop, art studio, computer lab, library, and more. Staying fit, healthy, and active is easy with a state-of-the-art fitness facility right on the property as well as an indoor walking track, dance studio, indoor and outdoor pools, an 18-hole golf course, and several miles of walking and biking trails. Residents can also break a sweat on one of the neighborhood’s many athletic courts. There are plenty of ways to stay social with neighbors and be engaged in the community with more than 135 organized clubs and interest groups. A sampling of clubs includes bible study groups, a bowling league, non-fiction book club, and golf leagues. As one of the area’s newest 55+ communities, Carolina Orchards is a gated neighborhood that’s slated to have 722 single-family homes upon completion. The Del Webb development began construction in 2015 so it only features new homes. It has a wide selection of designs and floor plans for potential homeowners. Layouts vary in size with options ranging from 1,234 square feet up to 2,565 square feet of living space. The clubhouse is a popular spot among residents and is where the community’s organized activity groups tend to meet. The on-site fitness center, indoor and outdoor pool, dance studio, and athletic courts make it easy for homeowners to stay physically active and healthy. Outdoors, residents can enjoy spending time with their favorite four-legged friend at the designated dog park, or, take up gardening in the community garden plots. Augusta Place at Laurel Creek is a small, age-restricted community in the Rock Hill area that has a variety of single-family residences with price points starting in the low $300s. Both new construction and resale homes are available with plans to only have a total of 52 home in the development, which will keep Augusta Place close-knit. Residences have been built by a number of different builders, providing buyers plenty of choices when it comes to the look and feel of their new home. Notable amenities include The Magnolia Room, which is home to a 4,500 square-foot ballroom, bar, and outdoor patio, as well as several parks and natural space, plus, walking and biking trails. The community’s Swim and Racquet Club is a big hit with residents and their families. It’s home to a Junior Olympic lap pool, gadgets and gizmos play pool, children’s wading pool, and a water slide that’s sure to keep grandchildren entertained. There are also three tennis courts for anyone who wants to pick up a racquet and play.